Community Classes Session II begins the week of January 28 and continues through the week of May 13, 2019! Scroll down this page for listings and tuition costs. Click below to view our brochure. Also, to receive text messages from WFMZ regarding any closings, sign up for that wonderful service on the following webpage: http://www.wfmz.com/weather/stormcenter You will receive a text message within moments after any cancellations are posted on the WFMZ-TV 69 website! Males ages 3 through adult are invited to enroll in our classes for no tuition costs – Boys Dance Free! This intense course of study is designed for the serious dance student with previous ballet experience. Placement of all students in this division is determined by audition. Classes emphasize the development of ballet skills with a focus on knowledge, proper placement, and alignment. Students will learn ballet vocabulary through barre and centre work while building stamina, strength, flexibility, and musicality. 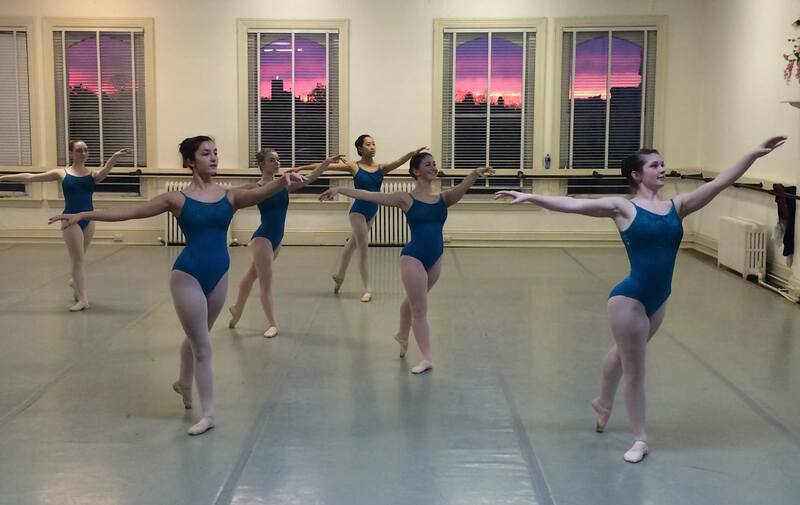 In addition to Pointe work, classes in Variations, Repertoire, Jazz, and Modern are also given. Additional performance opportunities will take place throughout the year. Dancers ages 8 & up who wish to join the Ballet Guild’s 2018-2019 Pre-Professional Division of classes are required to audition for placement. Email pyb@rcn.com; or call 610-865-0353 to schedule an appointment. Classes are offered for ages three through adult. The youngest students begin with an introduction to the basics of ballet; these include rhythm, dynamics, and terminology. Youth level classes are offered for the student who wishes to learn ballet or improve his/her technique without the commitment required in the Pre-Professional Division. Students ages 6 & up also have the opportunity to audition for Ballet Guild productions. Adults with or without dance experience will find our classes fulfilling and will gain a greater sense of well-being while learning a method of exercise that will last a lifetime. Space permitting, new students are accepted throughout the year! We offer classes for ages 3 to adult, including beginning ballet for teens and adults. Tuition price is for one class per week for the fifteen week session. ADULT/TEEN BALLET ▪ $300 – 2 classes/week -­ $485. Any 2 classes. Choose from list below—may also include the Saturday Intermediate Ballet Open Class in this discounted multiple class price. Adults interested in single class or drop in rates may register online and pay in the office when they attend class. Single class price is $22.00 per class. Questions? Please e-mail pyb@rcn.com; or call 610-865-0353. Schedule of classes and tuition prices for the 2018-2019 school year. Download the PDF to view. Adults interested in single class or drop in rates may register online and pay when they attend class.